Studios, Apartments, and Luxury villas embedded in the historical enclave of Corfu's Agios Spyridonas. In the midst of olive-strewn fields, goat paths, and whimsically wading shorelines lies Pyramid City Villas. With just under 5 luxury albeit individualised modern interpretations of Corfiot tradition, the family behind them brings it all together through their personal touch, providing the true Ionian lifestyle for guests - full service. In each, the interiors are plush and on-point. Sink down beneath Coco-Mat sheets, or indulge the senses through use of the fully-stocked kitchens. Either way, you won't want to leave. The terrace is always non-obstructive, giving guests full command of the landscape that defines this cerulian pocket of Corfu. But, there is no need to stay 'home' - as tempting as that may be. Here, the Pyramid City Restaurant boasts top reviews on sites like Trip Advisor - with villa guests coming back for more chilled-to-perfection wine and melt-in-your-mouth morsels. Though we had our foodie adventures cut out for us most nights, we found ourselves returning to the sea-side culinary concepts because it promised even more than gastronomy. Its urbane, sprawling open-air cafe-lounge setup characterises the heart of this villa community. Always within view of Pyramid Bar, sitting back and relaxing becomes a new favourite past-time while at the villas. It's made all the more tempting to continue from day until dusk while the waves lap up against the shoreline, conveiently just a few steps from your chair or sofa. And, if you're traveling with little ones, a thoughtful adventure park will keep them entertained. Situated in such a way that you know it's there but hearing other people's children is of little concern. While here, it often feels as though you've entered one of the islands' personal living rooms, where locals and guests come to meet, greet, and unwind. The clever hoteliers who designed the concept refer to it as Pyramid Seaside - and it is, exactly that! For those who are more adventurous or equestrian, a beautiful stable is tucked into the mountain scape moments from the villas. Booking tours horse back is easily done, and highly recommended as you're able to gain a perspective of the Corfiot lifestyle rarely achieved otherwise. On the outskirts, and throughout the nearby mountainside and town lies 4 more villas, a set of top-end apartments, and an acclaimed Corfiot restaurant (apparently one of the island's top three). Each studio, apartment, and villa has been thoughtfully constructed, playing on elements of traditional Ionian decor while giving way to modern innovation and luxurious design elements: infinity pools, paracope windows, and open concepts. Just steps from each, the shoreline delights with its diamond-like glimmer and tempting clear waters. Within minutes, swimming in the Ionian, or hiking along the old farmer's paths becomes an obvious way to spend the afternoon. A pitstop for rose and calamari is certain to present itself during your new found Ionian lifestyle. It merely becomes a question of when, not if. The nearby villages are defined by their rich histories, now presented through scrumptious gastronomy, stunning facades, and unique landscapes. By taking up residence in your villa of choice, you have the option of dining in, either through culinary self-expression or the services of a private gourmet chef. And, if it's a gastro-tour of the local delicacies that you're after, numerous restaurants do this section of the island; all reachable in less than a 10 minute drive. 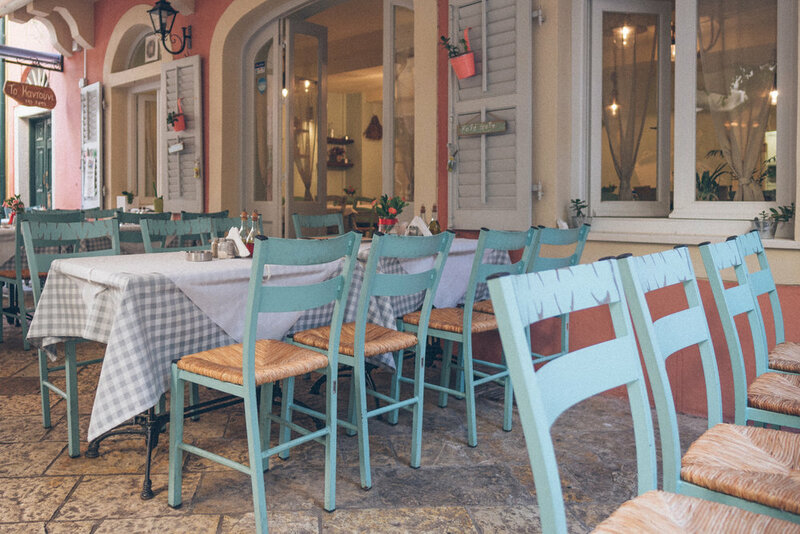 Start with Zephyros Taverna (5 minutes drive from the villas). Presenting itself as natural, sustainable, easy-eating restaurant, it's the perfect choice for lunch. Try the melanzanakeftedes (egg plant fritters), calamari, and house wine. Right across the road is George's (your soon-to-be second foodie stop), which serves up calamari that is sure to please, but a rose that's absolutely memorable. Quite possibly Georges will become your favourite dinner house should you like to take it easy and let the night give way to good conversation fuelled by liberally poured carafes. Served in copper pitchers, it harkens back to old Corfu and it's not sweet as you may be mislead to believe. And, if it's a night cap or evening dancing that you're after, Pyramid City Lounge and Cafe is nestled in the midst of all the action and with a restaurant rated as the top in the town, it can't be missed. Located in the north-eastern portion of the island, life at Pyramid City Villas is peaceful, contrasting the pace and energy of Corfu town, which is easily reached within 50 minutes by car. For additional details, use the comment section below about or check out the website.